(Nanowerk News) Miniaturization is the magic word when it comes to nanomagnetic devices intended for use in new types of electronic components. Scientists from the Helmholtz-Zentrum Dresden-Rossendorf (HZDR) have proposed the use of ion beams for their fabrication. An ultra-fine beam consisting of around 10 neon ions suffices to bring several hundred atoms of an iron-aluminum alloy into disarray and thereby generate a nanomagnet embedded directly in the material. A special holographic technique is used on a transmission-electron microscope (TEM) at the TU Dresden which shows the magnetic field lines and therefore helps measuring the precise dimensions of these nanoscale magnets. The scientists report on their experiments in the journal Scientific Reports ("Direct Depth- and Lateral- Imaging of Nanoscale Magnets Generated by Ion Impact"). Physicist Dr. Rantej Bali is particularly interested in finding new ways to miniaturize magnets. "One approach which we are adopting to this end is to use ion beams to generate magnets in certain materials," he said. An alloy of iron and aluminum is one such material of choice. It is paramagnetic in its ordered state, meaning that while the atoms occupy specific positions, the magnetic moments on the electrons, i.e. the spins, are oriented at random and are decoupled. Ferromagnetic materials, on the contrary, consist of coupled spins. In principle, electron spins can specifically assume two states. 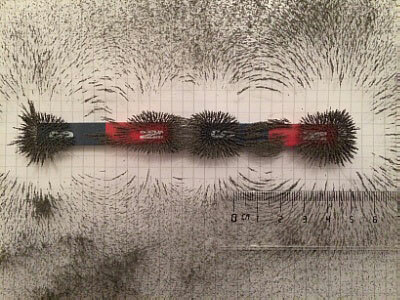 Read heads of computer hard drives or MRAM devices (magnetoresistive random access memory) use nanosized ferromagnets to read and store binary information. Spintronic applications are being vigorously researched worldwide, in search for denser data storage as well as for energy efficient computing applications. A new way of producing spintronic elements is to directly write magnets onto alloy layers using ions. Bali and his colleagues from the HZDR Institute of Ion Beam Physics and Materials Research have now fabricated such nanomagnets in a wafer-thin layer of iron-aluminum for the first time without the use of masks. "With our highly focused ion beam, which we use like a magnetic stylus, we can very quickly generate prototypes of complex magnetic geometries," explained Bali. Another advantage is that the nanomagnets are embedded in an electrically conductive layer which facilitates the development of spintronic components. TU Dresden physicists successfully imaged the ion-generated magnets, revealing their suitability for device applications. Theoretically, just one ion would be capable of generating a nanomagnet in the iron-aluminum alloy (Fe60Al40). For spintronics, such a sequence of ferromagnetic and paramagnetic stripes is interesting. "The ion microscope with the focused ion beam offers an extremely high lateral resolution," said Hlawacek, "allowing us the flexibility to generate prototypes of magnetic components." The nanomagnets were examined on the transmission electron microscope (TEM) in the Triebenberg laboratory at the TU Dresden, where TU physicist Dr. Falk Röder has mastered the art of TEM holography. This involves splitting an electron beam into two coherent beams. One of the beams falls upon the sample where it is affected by the magnetic field while the second beam remains free of any interaction. As these two beams subsequently overlap, it becomes possible to measure phase shifts which would otherwise remain hidden. "We can therefore measure the lines of magnetic flux of the iron-aluminum alloy directly and show them in detail," said Röder. The research team also wants to make joint use of the methods at the HZDR and at the TU Dresden in the future to fabricate nanomagnets in varying forms. The collision cascade is currently causing the magnets to be slightly wider at the bottom. "An optimization of the dose in further experiments will make it possible to produce even smaller and more accurately defined magnets," added HZDR scientist Hlawacek, convinced of the future potential. "Flexible magnetic prototypes, such as channels for the transport of spin charges, are needed for various types of spintronic components. Our ion microscope provides total freedom to engrave nanomagnets directly into material layers with very low currents of few ions, avoiding the cumbersome use of masks." His colleague Bali also wants to study single ion effects, and conduct suitable experiments to shed light on magnetism in disordered materials.